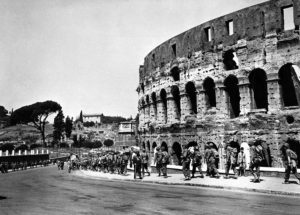 Italy did not perform well in WWII. The Italian economy was not able to support an effective industrial war machine, and Italy saw defeat in Greece, Ethiopia, and in North Africa. In 1943 Allied forces invaded Sicily, and with the noose gradually tightening, the High Council of Fascism voted Mussolini out of power.